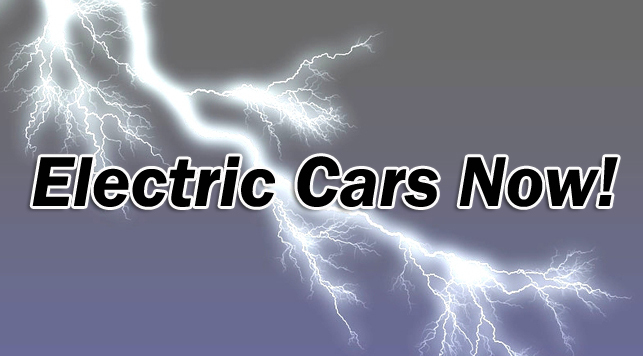 AutoSpeed - Electric Cars Now! Electric cars are a technology that seems to have been coming forever. But the situation is now rapidly changing, not just in the interest being currently shown by major manufacturers (try BMW, GM, Mitsubishi, Toyota and a host of Chinese car companies) but also because of two genuine breakthroughs. One is in the technology, and the other is in the new application of currently existing infrastructure. This article is based on material presented in a seminar by Dr Andrew Simpson. 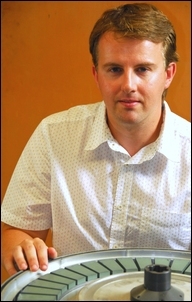 Dr Simpson specialises in technology and policy for electric-drive vehicles (EVs). He began his career racing high-performance solar cars across Australia in the late 1990s. His BE (Hons) and PhD were received from The University of Queensland with a research focus on assessing the technical and market potential of EV technologies. Since leaving Australia four years ago, he has worked in the USA to help bring EVs to market - firstly as a postdoc at the National Renewable Energy Laboratory in Colorado, and then as a Senior R&D Engineer at Tesla Motors Inc in California. Electric vehicles don’t solve all problems associated with personal road transport – but they solve a lot. They do not change the reliance that many societies have on cars – and the associated traffic congestion, widespread use of impermeable surfaces (roads, car parks) and lack of physical fitness that an over-dependence on cars can engender. So what problems do electric vehicles solve? While of course there will be some emissions if the electricity used by the electric vehicle is produced by burning fossil fuels, the emissions are no longer concentrated in areas of high traffic density. Furthermore, if the electricity is produced from renewable sources (hydro, wind, solar) there are no emissions at all. 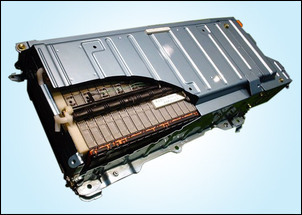 Electric cars can provide similar packaging, performance and styling to current vehicles. In most applications, their range is also sufficient. No one needs to be ‘sold’ on the concept of a car – unlike some other new technologies, the idea is familiar to all. 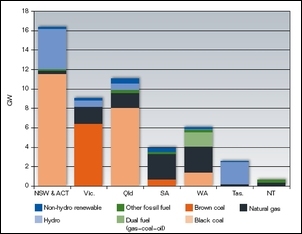 It’s a much overlooked point, but as this graph of Australian installed generator capacity shows, almost no electricity is generated by burning oil. Coal, natural gas, hydro, solar, wind – but oil, very little indeed. So if one of the aims of developing alternatively powered cars is to move away from a dependence on oil, electric cars immediately achieve that outcome. It’s often assumed that moving to electric vehicles does not give a clear-cut improvement in greenhouse gas emissions. After all, the logic goes, the power has to be generated somewhere. But as this graphic shows, short range electric vehicles have immediate benefits, and in the future, long-range electric vehicles are likely to have considerable advantage over petrol-powered cars. 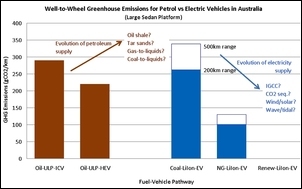 This graph shows that the modelled greenhouse gas emissions of a large Australian family car is about 280 grams of CO2 per kilometre, and a hybrid petrol electric vehicle of the same size produces 220 grams/km. An electric car using lithium ion batteries and powered from a coal-fired electricity generator already has an improved greenhouse gas performance – 260 grams/km, if a 200km range is assumed. If a 500km range is factored-in, the heavier battery pack boosts greenhouse gas emissions to 340 g/km. Power the same electric vehicle from a natural gas power station and there is a huge advantage over current petrol-powered cars – 100 grams/km (for a 200km range) or 140 grams/km for a 500km range. And for electric vehicles, things will only get better. Deriving oil from shale or tar sands, or gaining liquid fuels from gas or coal, all have much worse greenhouse gas signatures than current oil production. On the other hand, use of renewable electricity energies like wind and solar have vastly reduced greenhouse gas emissions – the future even better suits electric vehicles. Andrew Simpson’s modelling has shown that, right now, electric vehicles have lower running costs than conventional petrol-powered cars. And that takes into account battery replacement costs! Again working on the basis of a large sedan, the modelling used an electric vehicle with a 40 kWh battery, battery cost of AUD$12,600, and a lifetime distance of 445,000km (3200 battery cycles). He calculates a lifetime cost of 2.8 cents/km - depending on the price charged for electricity, a total cost of 4 – 8 cents/km. That compares with the modelled running cost of the petrol engine car of 10-15 cents a kilometre (the variation depending on fuel price). In short, the running costs are about halved. Now you can argue that, since the greatest cost of owning a new car is depreciation, and that very few cars of any sort travel over 400,00km, such a cost calculating exercise is full of holes – and there probably are some. However, in overall terms, the modelling clearly shows that it is quite likely that electric vehicles will have cheaper running costs than current cars. And, when you add the vastly lower maintenance requirements of an electric vehicle into the equation, the electric car benefit will become even clearer. So if the ledger is clearly now weighted in favour of electric vehicles, why aren’t they as numerous as fleas on a dog? Ask that question and the replies will include battery costs, operating range and charging locations... not to mention the idea that numerous new power stations will need to be built. But the truth is (and can be) radically different. 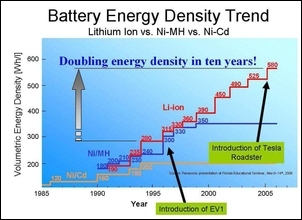 Firstly, over the last ten years, there has been monumental improvement in lithium ion battery technology. The US Department of Energy some time ago set the goal for an electric vehicle battery – that is, what the battery had to be capable of before electric vehicles could really be viable. Their specs included an energy of 25 – 40 kWh, peak power of 50-100kW, weight of 250kg, specific energy of 100-160 Wh/kg and specific power of 511 W/kg. With the exception of weight (450kg versus the requested 250kg), the battery pack in the current Tesla Roadster exceeds all these targets. The EnerDel battery pack in the TH!NK City exceeds all targets except weight (it’s just 10kg too heavy). The energy density (that is, how many watt-hours of energy capacity per litre of volume) of lithium ion batteries has in the last decade doubled – and it continues to rise, even as nickel metal hydride and nickel cadmium cells designs have flat-lined. 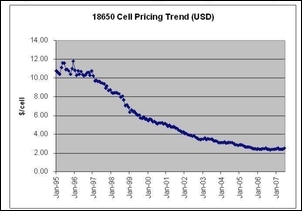 At the same time, the price of lithium ion cells has dropped by a factor of four! Some battery packs of the type being described can be charged in as little as 10 minutes; most others in less than an hour. However, the limiting factor in rate of charge is likely to be the power capability of the charging point – charging in ten minutes a battery pack the size of that used in the Tesla requires an electrical system capable of supplying over 300kW! Charging overnight? – no problem. So what about this huge drain on the electricity grid – surely, if electric vehicle use becomes widespread, new power stations would need to be built? Not necessarily! As most people are aware, the load on the electricity grid varies each day, in general terms being highest in the middle of the day and at its lowest in the middle of the night. In addition, there are also seasonal fluctuations in demand, with (in Australia) the hottest days placing the largest loads on the system. However, despite the electricity system being under-utilised for most of every day, the electricity utility still needs the power generating capacity, substations, wires, control systems (etc) to service the peak load. 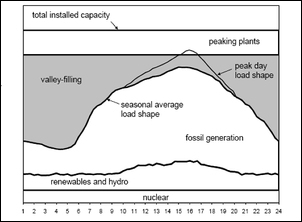 This graph shows the power consumption for a single day during peak season. 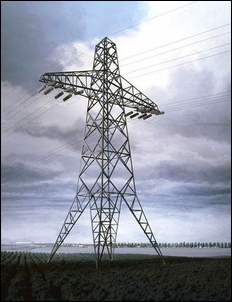 As can be seen, there is an enormous, un-utilised, capacity – indicated by the shading. Electric cars can use that shaded area – what is called ‘valley filling’. But to do so, most control over the recharge process must move from the individual car owner to the electricity utility. By using remote controlled ‘smart’ recharging stations (that can be located in owners’ garages), the utility can far better regulate the load on their system, winding back electric car recharging at times of peak load, and winding it up when the other loads are lower. Because the recharging points would be smart, the car owner could easily over-ride the system and charge the car whenever they want – but at a higher electricity cost. In fact, calculations show that by smart charging, the existing United States electricity grid can support 160 million electric vehicles - some 73 per cent of the current car fleet! In addition, because the electric vehicle load can be varied so easily by the electricity utility, renewable energy sources like wind and solar can be far better matched to the grid. More of our most popular articles. Drives like a big engine... but drinks like a little one! How do you achieve that? Drive a diesel? Find out when to change gear for best performance!